Finished reading Prairie Girl and thoroughly enjoyed this one! I loved all of the historical notes and tidbits, photos, drawings and generally in depth footnotes. And finally, I absolutely consumed Uprooted by Naomi Novik, which I read for week #45: A book with a 1-word title. I LOVED this one!! Not exactly a retelling of a fairy tale, but it draws on the fairy tale tradition, with lots of epic adventure, well-developed characters, magic, and great writing. A win/win kind of book as far as I'm concerned. I think it would even work as a "young adult" kind of book, but it's not really juvenile either (so adults will enjoy it). Although it's early in the year, I think this one likely will go on my Top 5 list for 2017. The author has several other books, so I may check those out as well. This one I was devastated to see end - I wanted to spent more time with the Dragon and our heroine, Agnieszka, and wish I could spend a weekend with her wandering in the Wood. I watched a really helpful tutorial on YouTube by Pam of Pam's Crafty Corner about working a single color of thread cross-country per page, and the lightbulb went off for me, so I'm going to try working the remainder of the page in this fashion. It seems to speed up the stitching (or at least it appears that way), since you aren't changing out colors and starting/stopping threads as much this way. I figure it's worth a try to see if I can make some more focused progress on this piece. I'm also thinking of switching up my rotation going forward in February, and making this my focus for a finish piece by working on it during Fri/Sat/Sun of every week, and then keeping the other 3 projects I've got going on a weekly rotation for the other 4 days. 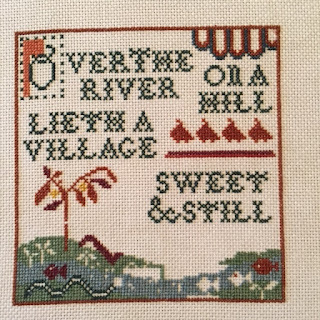 It will mean those other projects won't potentially get finished as quickly, but it will mean I will finish this one up faster (that's my hope anyway!). I'm going to give it a bit more thought, but I'm leaning towards that. This week in my current rotation was time to work on The Drawn Thread's Winter Garden. When I last worked on it, I had finished page 1 of 3 (with a bit more on page 4, but not a full page), and here's where I am on it currently (about halfway through page 2). The center of the design is the middle of the red door (located over the word "winter" pictured below). I'd thought I'd get through most of page 2 while it was out for rotation this week, but the house is taking a lot longer to complete than I thought it would, so likely that won't happen. I'll have another day or two to work on it, but then it'll go away for another couple of weeks until I rotate back to it in February. Next week part #2 of the Under the Sea SAL comes out on February 2nd, and this Friday the next clue in the Welcome mystery SAL will be released as well, so I'll have those to work on here in the short term. Just about done the shawl sample I'm taking to Stitches West. Worked up using a new speckled dye colorway and a tonal solid, this is a fairly easy elongated crescent-shaped shawl that I'll have as a featured kit in the booth. I have (I think) 2 more rows of increases to do for the cabled sweater I'm working on for a Filament magazine issue. 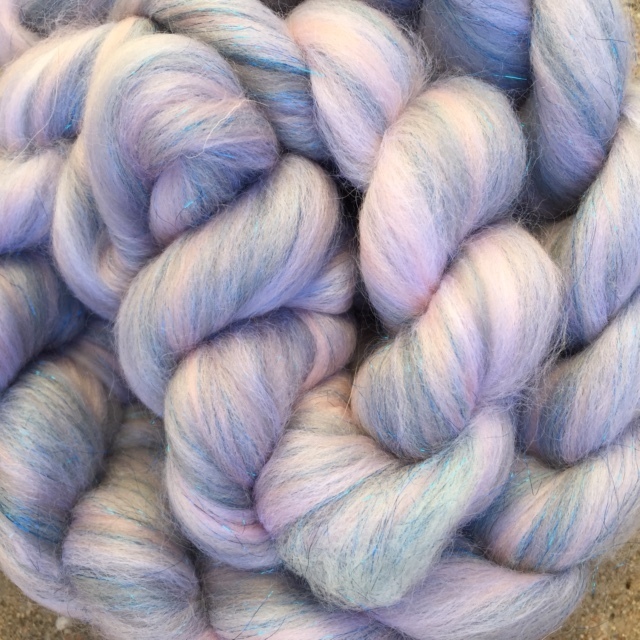 I'm working this one up in a yummy merino/cashmere/silk DK weight from Shalimar Yarns in the Water's Edge colorway. On deck is the sample for the March Sweater club, which will be knit up in my Freya DK (100% BFL yarn). I've got no personal knitting on the go right now, as I'm mostly just attempting to get thru the deadline knitting that I've got queued up for the next 2 months. Once I get the shawl finished up, I'll cast on for a hat/mittens set that's for the same Filament magazine issue since those are a fairly easy project (comparatively speaking). All of the above need to be finished up by the first weekend in March, so until I get to that point, I'm going to not put anything other than work knitting on the needles! I'm still reading my way through Prairie Girl (and loving every tidbit of every note! ), but hoping to finish that up this week. I've just finished the chapter on The Long Winter (1880-1881) and it makes you appreciate your local grocery store, even if they do run out of milk and TP during winter storms occasionally! I've also been reading I Shall Be Near to You by Erin McCabe, for week #32: A book with a long title. The author drew from a group of existant historical documents of American women who dressed as men (for one reason or another) and went off to fight in the Civil War. The book is fiction, so it's a mashup of several of the stories she researched. The main character leaves her family to follow her young, newly-wed husband off to war, and they've marched from New York to Virginia to fight. (They are fighting for the Union.) Rosetta (aka Ross) is a strong female character, but so far the book is a little....adrift? She's also more than a little annoying (she makes me want to smack her a lot). I'll reserve further judgment on this one until I'm finished it. Not awful/not great - but definitely not a book I have been highly engaged with up to this point. 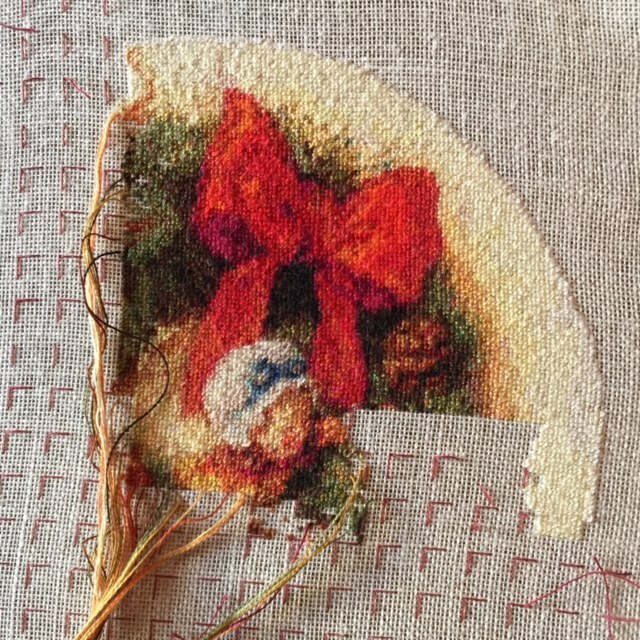 This week, I've been working on my Decorating the Wreath/Heaven and Earth Designs project. 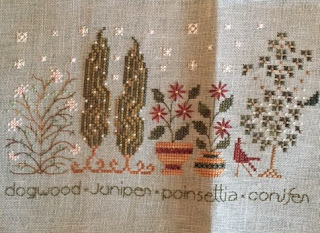 I'm going to be switching up my weekly rotation a bit, as I've decided to participate in Terry/Stitching Petunia's challenge #2, and will be working on this full-coverage project a bit every week. I calculated that I would need to work about 325 sts every week from now until the end of 2017 in order to have this project finished (which I really want to have happen! ), so I'm going to put this in at the beginning of every week's rotation and try to stick to that. I'll then work on whatever other project I have earmarked for rotation that week for the remaining days. So... Decorating the Wreath now looks like this, and I'll be focusing on it for the rest of this week - thru Saturday. Last week, I finished up the 2 clues that were released for the Tempting Tangles Welcome SAL, so that is caught up until the next clue releases in another week. I'm loving the thistles! 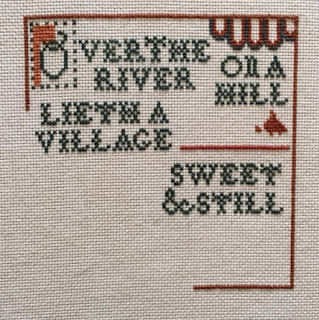 I also finished up block #1 of the Village of Hawk Run Hollow, and I recharted the bits of block #2 I wanted to personalize, so I'll be ready to start that in February. I finished up Some Kind of Fairy Tale by Graham Joyce, for week #2: A book with at least 2 perspectives. While I can't say this was a book I was in love with, it's a book that I will be thinking about in the future and would recommend for thoughtful reading. While the vehicle to move the story along is the old fairy tale about maidens being whisked off by the "people under the hill" during May Day, it's really an exploration of what is reality? And whose reality is right? I found this one well-written, and despite the fact the store unfolds from multiple view-points, it was easily followed and not disjointed at all. Right now, I'm getting my history geek buttons pushed with Laura Ingalls Wilder's annotated biography, Prairie Girl, for week 17 - a book with illustrations. This is exactly the kind of history book a like - lots of little details, photos of the people described, maps, handwritten diary entries and letters. I'm having a hard time putting this one down! TGIF! I've got some spinning to share this Friday with y'all. This is the December 2016 club fiber from Wooly Wonka Fibers, a blend of dyed merino and a slate-gray sparkle. Roving: Custom Blended Merino/Sparkle roving from Wooly Wonka Fibers Handspinner's Club, December 2016. 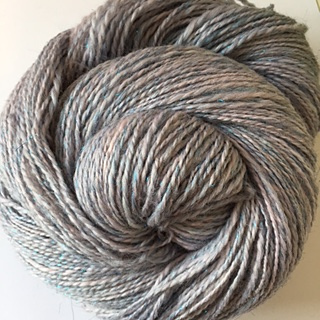 Yarn: 2-ply, 339 yards/4 oz of light sportweight. 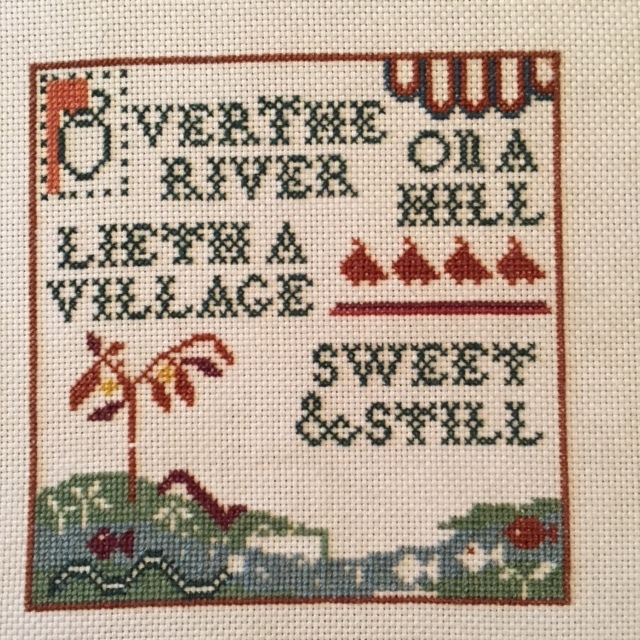 Last week, my New Start for the New Year piece, Village of Hawk Run Hollow was up in my rotation to be worked on. I started this New Year's Eve, and worked on it pretty steadily for the first week of the year, to get me to this point on block 1. My plan was to try to stitch up one block a month from this piece (there are 12) over the year, but this is one of the simpler blocks and I wasn't able to finish it, even with a lot of focused attention, in a week, so I may have to rethink the plan for this. This week for my rotation, I opted to work on my 2 SALs - Lakeside Needlecraft's Under the Sea and Tempting Tangles Welcome mystery SAL. Under the Sea started on January 2nd, so I had the pattern downloaded and ready to go. This month's motif is a little octopus chasing a fish. I'm using the called-for DMCs, except I substituted a handpainted cotton from Colour and Cotton for the lightest green, and for the backstitching color. I also added a blending filament in with the DMC for the seaweed vine to give it a bit of sparkle. This block is essentially done. The only thing not completed are some little white "bubbles", but I think I'm going to place those out with clear or white/pearlized size 11 beads. I'm going to wait and see what the other blocks look like before I decide on that. I can always go back in and add those. For the rest of the week, I plan to work on the Tempting Tangles SAL and get caught up on that. (I've already got clue 9 and clue 10 releases on Friday.) If I've got time left then between now and Saturday, I'll go back to working on Village and see if I can get that finished up before rotating on to my Decorating the Wreath project. One thing that I have decided to do is personalize the Village piece. I am going to be changing out the names of things in the Village to match names of my grandmother's family in their little area of central Pennsylvania, including changing things from Hawk Run to Moose Run (as that's the creek that runs through the area, and the name of the road they lived on). So I need to plot out the changes for block 2 to customize that before I get there in February. I finished Daughter of the Forest this week. I loved this book. A retelling of a fairy tale combined with Celtic legend and historical fiction - I was delighted I finally picked this one up and read it. Highly recommended if you like any of the above types of books. This week, I'm reading Some Kind of Fairy Tale by Graham Joyce, for week #2: A book with at least 2 perspectives. The premise of this book is that the main character, Tara, gets spirited away by the fairies (only don't call them that; they don't like it), and spends 6 months with them in their realm.... only to return home to find she's missed 20 years. Her parents and brother have all aged, but she still looks 16. Is she telling the truth? Or is she some poor misguided soul with some mental health issues? The book is written from Tara's perspective, as well as her brother's, her analyst's, her nephew's, and her old boyfriend. Joyce weaves the tale of Tara's time away intertwined with things that are happening to her in the present. All of which you can choose to find a (relatively) rational explanation for, or which you can choose to accept as the truth. Things aren't always what they seem. An interesting read so far. 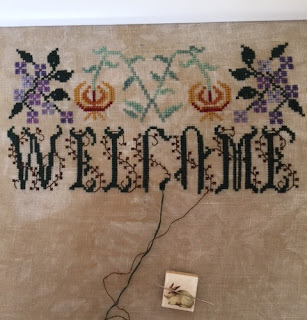 Trying to stick with my 2017 goal of reviving the blog a bit, I'm kicking off a new set of posts: Stitching Thursday, with details on the stitching projects I've got going right now. I've set up a weekly rotation schedule that seems to be working fairly well for me - I spend a week (Sunday thru Saturday) working on a specific piece and then switch off to a different one. I'm focusing on 4 projects per month (or close to that anyway) and a week seems to be a good amount of time. I stay motivated and focused and get a fair amount done, but I don't get bored or burned out on any one thing. Pattern by Carriage House Samplings. 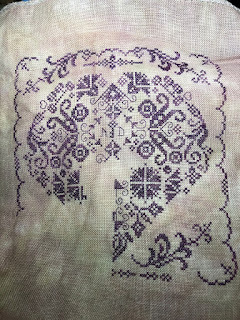 Fabric is a 22-count Hardanger from Picture This Plus in the Legacy colorway. This was a new start on January 1, 2017 and I'm planning on working on a block (there are 12 in total) a month. This is block 1 so far and what I'm working on for my January Week #1 rotation project. I'm stitching this 1/1. Pattern by The Drawn Thread. Fabric is a 32-count linen in colorway Smokey Gray. I'm using Gentle Arts threads for this (my own conversion). I've got the first page finished on this design. 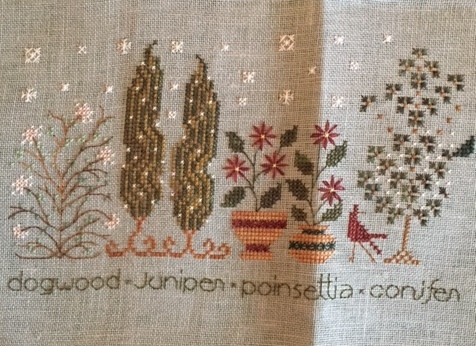 I'm stitching this 1/2 and this will be up for Week #2 in January's rotation. Pattern by Heaven and Earth Designs with artwork by Scott Gustafson. Fabric is a 28-count undyed linen. I worked on this the last week of December and finished up a page (the upper right portion of the image) that included the little pinecone and the bow. This will be my January Week #3 rotation piece. I'm stitching this 1/1. Pattern is a mystery SAL by Tempting Tangles. Fabric is a 32-count linen from Picture This Plus in the Wren colorway. I'm using Gentle Arts threads for this one (my own conversion from DMC). This is currently through Clue #8. Clue #9 came out the last weekend of December, and there'll be another clue released on the weekend of January 15th. I'll get caught up with those 2 clues for my final week of January's rotation. I'm stitching this 2/2. I'm also planning to start the Under the Sea SAL from Lakeside Needlework. I have the SAL fabric and the threads ready to go. The first clue came out January 2nd, but I am planning on working the 2 SALs the same rotation week, so I'll be starting this one once I finish up the next 2 clues in the Welcome SAL. I do have the DMC floss called for in the pattern, but I think I'm going to switch it up and use some handpainted cotton threads from Colour and Cotton instead. At least for the first block, I've got all but maybe 1 color that'll match pretty closely to the original colors. (And if I need to, I can sub back in the called-for DMC). I tried. I really tried to finish A Cornish Maid for week #4. I just couldn't. It wasn't a bad book, per se, but man-o-man it was S.L.O.W. I was halfway thru it and there was virtually no plot advancement. So I ditched it. I'll pick something else for that week. In the meantime, however, I read The Secrets of Wishtide, which is a new-to-me author (for week #22), by Kate Saunders. A fun, entertaining read - a mid-19th century historical mystery. I enjoyed this one and was suitably impressed the author actually did a lot of research (the suet pudding receipt is worth the price of admission by itself), and didn't just toss the characters into corsets and called it "historical". An engaging heroine and supporting cast of characters, reminiscent of a bit of Jane Austen vibe. If you are in the market for a lite read, and enjoy that sort of book, you'll likely enjoy this one. Next up, is Daughter of the Forest by Juliet Marillier. This is a retelling of the Six Swans fairy tale and I am REALLY enjoying this book. I'm using this for week #11 - a category from another challenge (last year's challenge had us reading a retelling of a fairy tale so this fits that perfectly). I'm about halfway through it, and reading it in bits and pieces as it's so good I don't want it to end!